(about 100 yards wide and 6 feet deep ) were surprised to find it clear of obstructions, unlike other bayous that approached New Orleans. Bayou Bienvenu led to Bayou Mazant , which leads to a drainage canal that empties into the Mississippi River about 9 miles south of the city. Through this unexpected avenue, the British could take the city, at great effort, if they could move fast enough. At Lake Borgne, thousands of British soldiers, under the command of General John Keane,were rowed to Pea Island, about 30 miles (48 km) east of New Orleans, where they established a garrison. "I shall eat my Christmas dinner in New Orleans," Admiral Cochrane had said on the day of the landing. On the night of Dec 22, the British advance chose an approach which Jackson had least expected them to take, disembarking 2,000 men on Lake Borgne, who managed to get across the swampy ground and appeared in the morning on the left bank of the Mississippi and capture the Villere plantation 8 miles below New Orleans through Bayou Bienvenu, which despite Jackson orders to block all bayous south of the city, remained unblocked. This was the responsibility of Major Jacque Villere's son, Major Gabriel Villere, who decided not to block the bayou that was on his own property . Major Gabriel Villere was almost court-marshaled for his failure to block the bayou, but was acquitted because of his brave acts afterward. The British, with their rapid advance, were able to capture an American picket force of twelve men stationed at Fisherman's Village without a shot, commanded by Major Gabriel Villere, who spotted flashes of red in the nearby orange grove. The British had bribed a Spanish or Isle�o fisherman at the Fisherman's Village who led them on this route. I have not been able to determine the fate of these Spanish or Isle�o fisherman after the battle. Were they arrested, run out or worse ? Many Isle�os fought with bravery with the Louisiana militia. These fisherman also informed the British that the American force numbered no more than 5,000 dispersed on many fronts, which was very accurate information. The captured American soldiers told the British the American force numbered about 20,000 . An American doctor ( a Dr.Morell ) and a navy purser (Shields) who came out to the British fleet to treat the prisoners of the gunboat battle who were being held on the HMS Gorgon . The doctor found the injured prisoners being well treated, and found himself,Shields and their crew were also now prisoners who were not released until Jan 12, 1815 . Cochrane ordered men to listen to their conversation in a room next to where they were being held aboard ship . The Americans, suspicious that they were being overheard, exaggerated the size of the American force to number some 20,000. This led the British to believe they were facing a much larger force, perhaps leading Keane, who was in charge of the first British force that landed, to await reinforcements instead of marching on the city immediately, perhaps saving the city. This impression can be seen in Gleig's book. The British should have believed the Spanish. The Villere plantation where Major Gabriel Villere escaped. It was used as the British headquarters. It burned in the 1930's. Jackson had expected them to come via the plains of Gentilly. Had they advanced immediately into New Orleans, they probably could have taken the city . Col William Thornton ( 1779 - 1840 ) urged an immediate attack on the city while the defenders were unaware of their presence. Keane decided to wait for more reinforcements and artillery, dooming the British operation. This gave Jackson time to concentrate his forces, who led a ferocious night attack on the British on the night of the 23rd . Col Thornton's (Brit) advanced guard reached the Villere plantation about 11:00 am on the morning of Dec. 23 , where they captured Major Jacque Villere (owner of the plantation) who was in charge of the area and a large part of a company of the 3rd Regiment of the Louisiana militia. Major Villere managed to escape, by jumping out a window with Col Thornton yelling "Catch him or kill him !" ( He had to kill a loyal dog that could have given him away, a regret to his dying day ) and hastened to New Orleans with the startling news. When Jackson was made aware of the situation, he declared " By the eternal! The enemy shall not sleep upon our soil!" The route of the invasion was a complete surprise, and there was not yet a defensive work to halt the British advance. By this time the British had already landed about 1,700 men, the 4th,85th and the 95th and they set up positions at Lacoste's plantation while Keane set up a headquarters at the Villere plantation. Jackson issued orders rapidly. Available troops were to attack the British that night. In the afternoon he stood at Fort St. Charles at the foot of esplanade and watched his troops pass. The prompt steps which Jackson took to engage the British on the Villere plantation was the deciding factor in the failure of the British to take New Orleans. The British camp was some 200 to 300 yards from the levee, which was only three or four feet high at the time. the British troops spent many hours on crowded boats and covering rough country and arrived exhausted. The British had no mounted troops and American cavalry units prevented extensive reconnaissance on foot. Captured Americans gave the British an inflated picture of Jackson's force, and Keene decided to await more troops before advancing. Coffee's riflemen and Hind's Mississippi formed the advanced order of march. Beal's New Orleans rifles followed closely after. A slave was apprehended, who had been sent by the British with a proclamation in Spanish and French in terms as follows: " Louisianans! remain quiet in your houses; your slaves shall be preserved to you, and you will be respected. We make war only against the Americans." this was signed by Admiral Cochrane and General Keene. The British did not expect an attack, much less an attack at night. In Europe, battles were not fought at night. However, the militia they faced in New Orleans were a different lot than those found to the north. They were toughened by the Indian wars, and some of the Indian guerrilla and night fighting styles had rubbed off on these American fighters. About nightfall the troops were formed in a line of battle. The left was composed of Coffee's men from Tennessee with 563 men , Capt. Beale's Orleans Rifle company with 62 men, the Mississippi dragoons with 107 men under Major Hind , a detachment of 22 Marines under 1st Lt. Bellevue supported by a detachment of marines, the 7th Regiment under Major Henry Peire with 465 men and 44th regulars under Col. Ross, 288 free Men of Color under Major D'Aquin from St. Domingo, a squad of 18 Choctaws under the command of Capt. Allard, Major Plauche's Battalion of Orleans Volunteers with 287 men, Capt. Sprigg's company of 110 Boatmen . About 1,568 men in all. 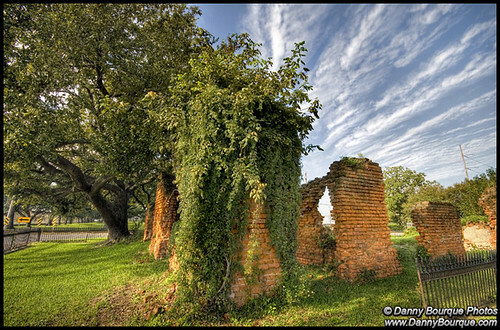 Ruins of the De le Ronde's Plantation on what is now the neutral ground of St. Bernard Highway near Paris Road. It was a temporary British headquarters and hospital. De le Ronde's Plantation in 1866 . The British army was made up of the 21st, 49th with 331 men and 93rd Regiments and a corps of artillery, about 2,500 men, under the command of Colonel Thornton, who proved himself a skilled commander in the coming battle. Jackson ordered General Coffee with his Tennessee mounted riflemen, Hind's Mississippi Dragoons and Beal's Orleans Riflemen to swing to the left toward the river and attack the British right flank. The American right attacked down the levee road with two field guns under Lt. Samuel Spotts and Jackson commanded the troops on the right flank. The land attack by Jackson was coordinated with a bombardment by the schooner Carolina with 6 pounders on the broadside and a 12 pounder for and aft and had a navy crew of about 89 men. Shortly after dark the Carolina moved down river and anchored about 100 yards from the British position. The British assumed this was a British ship or from friendly French and Spanish natives, rising against American rule and did not seek cover. Plantation, where the night battle took place. The American attack started at 7 p.m. with a broadside of grape and canister from the Carolina that swept the British troops at their campfires . Some of the British, who were close enough to hear the sailors on the ship, heard a shout of "Give them this for the honor of America !" The British moved behind the levee and fired at the Carolina with their rifles, which were ineffective while their wounded shrieked and groaned nearby. Later artillerymen from the Villere plantation brought up two equally ineffective 3 pounders and Capt. Lane's rocket company fired 12 pound Congreve rockets, which also had no effect. Jackson began his main attack at 9 p.m. His column going down the river road met a strong British outpost a battalion of the 95th Rifle Brigade, which halted the column. Lt. Spotts two field pieces went into action, but a strong British counter attack almost captured them . Jackson noticed his plight and in person led the 44th and 7th regiments to their rescue. The fighting along the levee degenerated into brutal hand to hand combat, with the British using swords and bayonets and the Americans using tomahawks and hunting knives. The Carolina ceased fire and the entire battlefield was turned into a thousand individual combats. It was impossible to tell friend from foe, and soldiers on both sides were tricked by soldiers on the other side claiming to be their mates, to find themselves surround and captured by the enemy. Both sides stopped using their artillery out of fear of hitting their own men. More of Keane's troops moved up to the battle and Jackson ordered a retreat one mile to the Rodriquez Canal around 3 a.m. The American set many bivouac fires to give the impression of a larger force. The British remained by the levee where they were first encamped, unable to light a fire to cook a meal out of fear of attracting the attention of the Carolina's guns. Early on the morning of the 24th, every available man was put to work throwing up a breastwork on the New Orleans side of the canal. General Morgan was ordered to abandon his position on the opposite of the river at English Turn and move his command of Louisiana militia to a position opposite Jackson's on the other side of the river. At this time, the slave trade was illegal in the British Empire by the recent Slave Trade Act of 1807 . During the Royal Navy�s blockade of the Atlantic seaboard, roughly 4,000 slaves escaped onto British ships, where they were welcomed and freed. Many of them joined the British military, participating in the Battle of Bladensburg and the burning of Washington, D.C.
Cochrane believed that slaves in great numbers could be recruited to fight the United States. Their hatred for their masters and their masters' fear of them combined to make them especially valuable. The British soldiers were shocked by the treatment of some of the slaves they encountered as they entered the plantations. The British offered freedom to slaves and about 160 left with the British when they left New Orleans . Two missions, one in February 1815 and the other in March 1815, were sent to the British after the battle to seek restitution of slaves, which were valuable property. Only a handful of the formerly enslaved persons elected to return to their masters . The former slaves were transported to Bermuda, Canada, or Trinidad. Fear of a slave revolt was great in the New Orleans area . The recent 1811 slave revolt on the German Coast ( East bank of the Mississippi River in what are now St. John the Baptist and St. Charles Parishes, Louisiana ) and violent Haitan Revolution (1791 - 1804 ) stoked these fears . If the British had remained longer in Louisiana they could have sparked a slave revolt . The attack convinced the British that the force defending New Orleans was larger than what it was, delaying an immediate attack. On the next day, the British were reinforced by 5,000 veteran troops. The Americans suffered a reported 24 killed, 115 wounded, and 74 missing or captured, while the British reported their losses as 46 killed, 167 wounded, and 64 missing or captured. Jackson also began construction of a fortified line behind an old canal bed below the city.